12 GO IN. 1 COMES OUT. Enter a zombie-infested area and compete as one of 12 players to become the only survivor. Scavenge for weapons, destroy zombie hives to level up, and combine your advanced parkour mobility with brutal combat skills to outrun, outsmart, and outplay your opponents. Dying Light: Bad Blood Early Access Now Available! Drop into the hot zone and come face to face with deadly zombies while competing against 11 others to become the true survivor! Dying Light: Bad Blood is now available in Early Access, and with it you can enjoy a different Battle Royale experience (or Brutal Royale if you prefer) which takes some of the best parts of the original Dying Light experience and puts it into a competitive multiplayer mode. Like the original you'll need to find resources, craft weapons and parkour to avoid enemies while you try to survive zombies and other dangers lurking the streets. 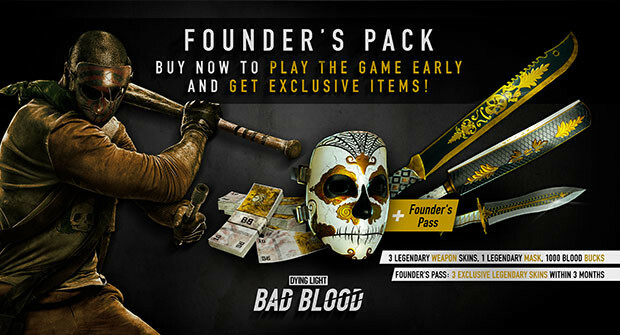 Those who purchase Dying Light: Bad Blood today will get the Founder's Pack bonuses which adds an exclusive Golden Founder's Mask, 3 legendary weapon skins, 1000 Blood Bucks for use in the in-game store and 3 legendary skins that will be delivered over 3 months. 3 exclusive Legendary weapon skins: Golden Neckslicer (dagger), Golden Bonecleaver (machete), and Golden Skullopener (cricket bat). Kill the zombies and destroy their hives to collect blood samples and level up your character. Prey on other players, steal their loot, and become the only one to leave the zone alive. Immerse yourself in the blood-soaked FPP combat known from the highly-acclaimed Dying Light, now with greater tactical depth, new moves, and tons of vicious weapons. Collecting the samples levels up your character within the match. With each new level, you get fully healed, your max health increases, and your attacks deal more damage. Remember, though, the more time you spend harvesting samples, the less time you have for looting weapons. When harvesting the hives, be prepared for all kinds of zombie resistance: from relentless Virals and swarming Biters to armed Goons and devastating Demolishers. The heavier protected the hive, the more samples it hides. Forget flat and open battle areas. In Bad Blood, combat takes place in dense and multi-layered environment, so you have to be constantly aware of what’s around, beyond, and above you. Purchase Dying Light: Bad Blood today! Want even more Dying Light? Save up to 67% off the original game with our Dying Light Promo which lasts until September 21st at 5pm BST.